I Got Garbage for Christmas. A foot! 2 of them actually! Finally the central portion of the sock is done! The stitches have been divided, (and everything is all a bit awkward right now) and work has begun on the foot portion of the sock. At this point the center bottom of the sole is 5 inches long, and the instep is 0 inches long (OK, maybe 0.25 inches)--The sole needs to be 9 inches (4 more inches) and the instep needs to be 7 inches. At the same time, the 80 stitches I started the foot with need to be decrease—to something closer to 66 or 68- so there is going to be some shaping going on—short row shaping. The foot portion (and the leg portion) started out with 80 stitches each. So step one is decreasing—which will be done on the center top of the sock. The first few rounds (that 0.25th's of an inch) were all decrease rounds The first 3 rounds after joining the top of the foot were worked with 2 decreases per round (80 minus 6) and one set of increases--(the sole portion of the foot has been increasing 2 stitches every 3rd round for several inches now, and I want to keep that up (and keep the bias fabric in place.) But decreasing every round is too steep a slope. So now the decrease will proceed at 2 every other row. BUT—If I am going to continue the bias patterning—with every 3rd round, there will need to be a set of increase on the sole. So I will be both decreasing (on the instep) and increasing (on the sole)--but at different rates. Taken over 12 rounds, there will be 4 sets of 2 increase (8 increases in 12 rounds) on the sole, and 6 sets of decreases on the instep (12 decreases in 12 round) or a net of 4 stitch decrease—which is not enough. Well I am not exactly sure! 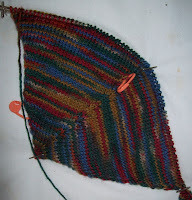 68 stitches is more than average--(for me, by about 8 stitches) but with a bias knit fabric, more stitches are needed. The stitch count will be close to right. I can always omit a short row, or more likely, add one—depending on how the socks fit. I will still need 4 more inches of instep—but only another 2 inches or so on the sole—So a more intricate set of short rows will be needed for the toe final few inches and toe shaping! But I can live with that—they are only socks after all! Yet. I wonder if there will ever be enough! I haven't moved the stitch markers since yesterday—you can see, more than a half inch of knitting has been added; And still more is required--not much, BUT! Will this heel ever be done?! I realized last night-I am going to need a third needle (or to transfer half the stitches on to a stitch holder) when I finally finish this section and begin to work on the foot. I think this is the time to make use of my Boye Interchangeable needle set, and to knit the final row onto a cord, remove the needle tips and cap the cord. I actually have 3 Boye sets—I went out and bought one some years ago—after procrastinating forever. And then, less than 6 months later—I inherited one with stash—and then, a year after that, with a second inheritance (another SABLE that came my way) a third one. The last set came in pieces—I had to go hunting among a bunch of UFO's to find all the pieces—but they were all there. I know I have supported Boye needles and the interchangeable sets in the past –(and I still do). Having learned to knit with the old fashioned circulars that had piano wire type cables, even Boye's stiff cords are a pleasure—but both stashes came with LOTS of needles—not just the Boye sets; and I had lots of needles to start with—so they are over kill, and rarely used. When you have a choice of super flexible cables, or stiffer ones—well, the super flexible ones win out every time. 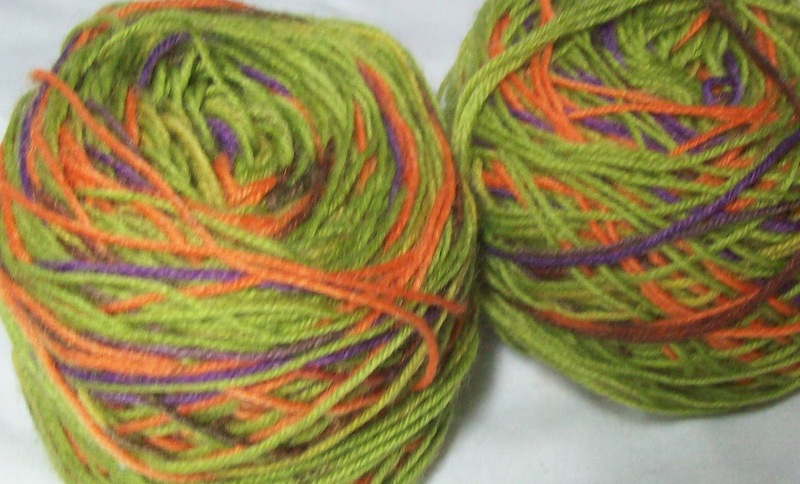 So first I had do dye up some yarn. Here is the black eyed-Suzies yarn--(for a pair of color work socks) –the yellow is too orange, the red, too pinkish-purple, the brown, too light. The colors are all wrong—but I love them! The result is too beautiful for words! I think the results will be beautiful—if not a perfect match to the most common Black Eyed-Suzies. Thank goodness flowers come in all sorts of colors! I have to ball it up and to divide it still-- And to divide a skein of green, too, for the second color (a plain simple green) While I have some ideas of the stitch patterns I want to use—I haven't settled on any ones yet.. So the sock kit will hold some graph paper index cards (and some colored markers) . That will makes 7 kits set up. That's more pairs of socks than in many clubs! 3—White topped brown socks—Plain white giving way to some color work, then changing over to solid brown (for the foot)--maybe a bit more of patterning just before the toe shaping. Inspired by Katherine Misegades design—but not quite the same. 4—Solid green for a leaf design—a lacy, leafy cross band border, and a leaf motif in the leg, too. 6-- A plain vanilla pair of sock in Kroy fx –color way clover. The Black eyed-Suzies will be kit 7. A nice mix of colors, techniques, stitches. 1—Spats (aka saddle socks) a two tone pair of sock that look like spats. 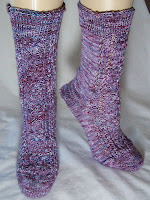 2—A Pastel spiral (helix) sock. 3—Dragon Socks—In red and black (2012 is the year of the dragon!) -- But since its also a water year—I have been thinking--maybe the sock won't be red and black—but will be blues and green dragons! 4—Another pair of beaded socks—Prussian blue, with silver bead work. 5—Another pair of puffy socks—but in a different color way—tentively, Yellow, going to marigold, to orange to rust to brown (there will extra brown left over from the brown and white socks!) And at some point, there will be a pair of puffy socks in shades of blues and greys. That's 13 pairs of socks already thought out and planned—and there will be secret socks, too, and other knitting... A pretty ambitious plan for next year! Especially considering, I still haven't finished Decembers sock (but I did knit two secret socks this year (one in the summer, and the pair just finished)) so I have already knit a bakers dozen!--Decembers sock will be the 14th pair for the year. 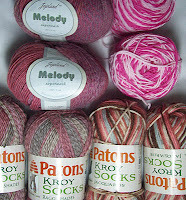 As an aside--all this sock knitting is still not enough to make a serious dent in my sock yarns stash--and sales and yarn companies are likely going to try to entise me to buy more sock yarn. 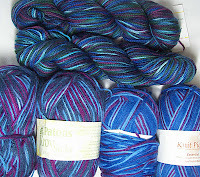 Knitting up all my sock yarn is a Sisyphean task. Not that I am think yet—but I am 20 pounds light—A nice start to even less of me! Losing weight (planning meals, eating healthy (shopping for fresh vegetables) getting exercise has been a real priority. It's showing. Sewing is soon going to become a higher priority than knitting, too, since a 20 pounds lose is enough that a lot of clothes don't fit! I can sew some elastic into some waist bands—and get some more wear out of some of the clothes—and some can be altered, (easily) but I really need some new clothes, too. I still haven't sewn up the fabric I bought last year for skirts—and instead went out and got more fabric (60 inches wide and only $2 a yard!) and a pattern for a Jumper*. (Simplicity pattern no.9890--I can't find it on the web site) Skirts are more fitted and harder to alter—and either fit or don't. Jumpers can be altered a bit more easily--long darts front and back can make them more fitted in a flash! And since they hang from the shoulder –losing an inch or two from the waist doesn't make them unwearable. –(*Note here—an american-english jumper--a sleeveless one-piece dress, that pulls over the head (no zippers required)that can be worn as is, or with a thin (cotton t-shirt) shirt under it. )The pattern also includes a top—a camp shirt like jacket to be worn over the jumper. Some of my fitted skirts are so loose that they fall over my hips now—while the waist band is still buttoned, and the zipper is still unzipped! Sure I can add a belt—but the bunched up look when is not very attractive (and hides my weight loss too!) Even the elastic waist skirts are too loose. I have been making all sort of efforts in all directions— beside weight loss—I continue to clean—and organize (and cull!) stuff, and while knitting and blogging about knitting has fallen short, am working on pattern ideas, and getting some basic outlines of patterns written (and finishing up on pattern documentation I've started and never completed.) Culling old files and backing up the keepers goes on, too. 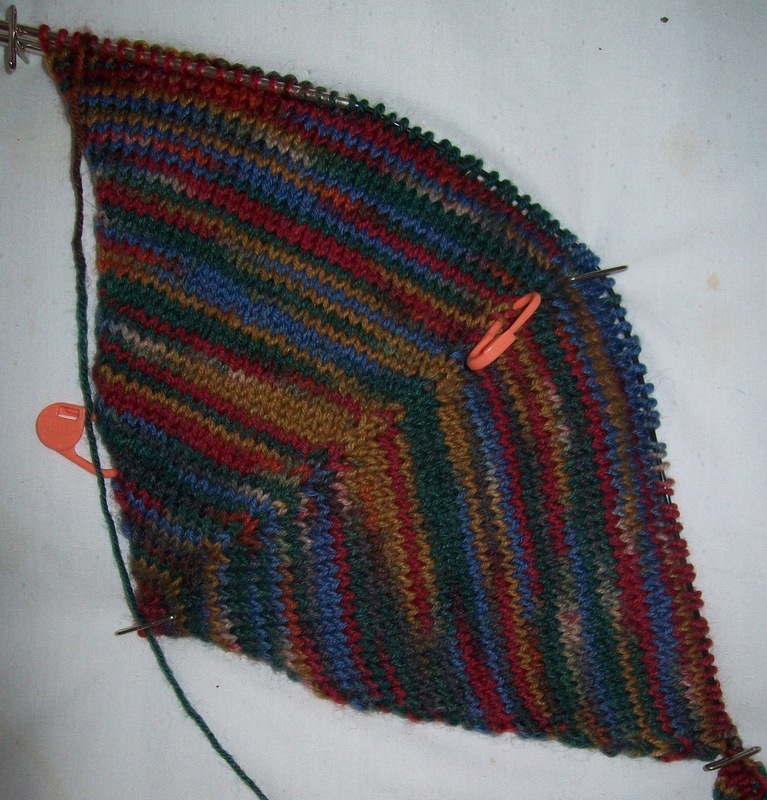 Since I haven't been knitting much--(and since normally I am so abnormally obsessive about it! )I haven't much to say. 1—The secret socks got finished—and are even longer by a few rows (a half inch or so) than average socks. (They got photographed this AM)--I am happy with the final results, too! 2—Decembers socks? Well maybe I'll have them finished by the end of the month/year—but... just. I've worked a few more rounds (and the socks now have 36 stitches per sections—4 sections per sock or 144 stitches—and I still need more rounds, more increases, more damn knitting before I can start decreasing and shaping the foot. And every round is so damn long! These socks are going to be one of kind—I can't imagine knitting them again! I really want to get there (have this portion done) —I obsessively try on the sock—hoping (though I know in my heart of hearts it still not there yet) it's big enough. The (hard to see) white wire is one of my wire coat hanger sock blockers--and clearly the heel section is still short of reaching the top of the instep! On the other hand, the sock has a good part of the bottom of the foot and the back of the leg knit... 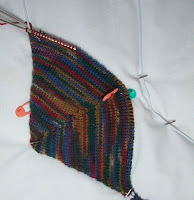 I am counting on this to make both the foot and cuff portion of the sock a bit faster (once I get to them!) to knit. Labels: Decembers sock, semi secret socks, sewing. And I couldn't be happier!--Wait let me explain. Since I was teen ager, I've been the person who has collected box top or labels and sent away for promotional products (and unlike Ralphie, I never ended up with a decoder ring and been disappointed). I've been a coupon queen—once (back in the lat 1970's) buying a full cart of groceries (over $100 worth) for just a few ($2? $3)--including meat, potatoes and fresh vegetables. Promotions have changed over the year, and many now can be done on computer, with nothing to mail in. And while I do fewer, and I am less compulsive about it, I still participate. Since they started, I have been one of the people participating in MyCoke rewards program. On disadvantage to this promotional scheme (to all promotional schemes!) is the quantities required to get anything-- Along the way I have learned tricks to extend my ability to garner points. NY State is one with a bottle recycling program—and the recycling machines used often kick out the bottle caps—slip on a disposable glove, and you can sort through a bunch of caps and find some from CokeCola products—and add some points (with out more purchases.) I confess, I do this all the time. Yesterday—while shopping for a Sunday paper—I checked the bottle machines—and found myself 9 caps--(It would take me a month to drink that much soda!) a bonus! Each cap is worth 3 points—and may rewards take 300 (or more!) points—It's not a very generous rewards program—so scrounging for caps is, well, one aspect of my compulsive behavior. At home I washed them (in hot water and a little bleach) and dried them, and counted them. 71 caps! With my measly 9, that's 80 in all. And 80 times 3 is 240—a substantial number of points! I don't usually drink cans of soda—but every once in a while its nice to have a small controlled portion. (I used to love these coupons when I worked—I could carry a coupon to Manhattan, and buy a 12 can pack a the local drug store—so much easier than lugging all 12 cans from Queens! (up and down subway stairs—and a few block of walking too!) Then, when I worked late, I enjoyed treating my self to a can of soda (I tend to drink soda after 4PM—and more after dinner..and not that much ever.) It made long hours more enjoyable—but since I am not working, I don't think so. They also have rewards for free movie rentals (cheaper than a movie ticket) and for a lot of promotional clothing (I have no interest in wearing CokeCola T shirts, or hat, or carrying a lunch bag with a promo, or a key chain, or ...) and other stuff—lot of free subscriptions to magazines (none that I generally read, but..) and photo products, and.. well other things I am not interested in. Still, in all, Free stuff! Isn't that what we dream about? I especially like free stuff that is intangible—a free movie ticket/experience take up absolution no space! It's clutter free! And for me, a bit of a luxury. I got a lot of other nice stuff for Christmas—I am blessed with generous loving family and friends—and it warms the cockles of my heart, that I got some garbage, too! A little bit here, a little bit there, and eventually, I will have something. But right now—it seems like nothing is getting done! The endless heel and ankle on December's sock still haven't been finished. The dull boring part of the secret socks are incomplete, too. Hours of frustration are slowly giving way to a new web page—right now it looks crude but slowly oh, so slowly, the backbone is being built, the pages are being fleshed out. Drag and drop page builders are convenient—but I want more than they offer, and each page needs to be tweaked. And while I know there are certain bell and whistle I can and to make things better—I haven't done much with HTML in the the past few years, and I am repeated forced to look up the code details. Not to mention the getting the domain host and the page host on speaking terms! The new web page won't make its debut till sometime in the new year—But it is something I am working on every day—As well as culling old files (13Gigs of old files disappeared today!) and backing up the remaining files. I'm doing real cleaning up. too—much of it, too long neglected—every day something gets put up, or put away, or thrown away. Sometimes it's just the smallest of thing—Or even just everyday things (tomorrow: laundry—just 2 load—Not letting it pile up! (and become overwhelming!) But I am working at it. On the calendar is a reminder to sign up for a water aerobic program—Since more exersize is another item on the agenda. I am still procrastinating on buying speakers—but they are on the too list, too And sewing is going to have to move to front and center, soon, too. The good news is a whole lot of clothes are becoming too loose—and either need to be taken in, or thrown out. The bad new is: New clothes are quickly becoming needed. Are almost done –they are anklets now—but won't be finished till they are taller, mid calf length socks. Most of yesterday was spend in NYC HHC (Health & Hospial Corp) Primary Health Care—a service I didn't know about—but that now serves as my health care center. I can't complain about the quality of the care—the doctors, the nurses, the service available are all top notch—but SLOW? Incredible slow. Hours are spent—The first 2 hours weren't too bad—A lot got done. But then there was a wait for more stuff--and after 4 hour hour wait, I decide I could wait a while longer for some of the services offered—and gave up and went home. By then, I was already re-acting to the Pneumonia and flu vaccinations--(the pneumonia one more) my arm was achy, and tender, and by the time I got home (a 30 minute commute) I had a low grade fever. In the first 2 hours, I had seen a care nurse who check my blood pressure, weight, temp and respirations, I had seen a doctor did a complete exam (including checking on my now nearly healed leg) and who scheduled a ton of tests and some meds. I had seen a RN for the afore mentioned vaccinations, and a pre-care instructions for a colonoscopy (scheduled), and an optical technician who checked my eyes. So knitting was done for the day—and so was I. No blog, no photos, nothing else done, either! There are 4 sets of increases—1 Center of the sole, 1 center of back , and 2 that run up on a diagonal to the top of the instep. Once I get to the top of the instep, I'll break—and begin to knit only the foot. At that point the foot will have half the stitches (or about 74 )and they will be decreases (creating in effect a gusset) until there are circa 60 stitches. I'll continue to increase on the sole, (and do double decreases on the top of the instep) and will have a diagonally knit foot. At some point, the sole shaping will end, the rows will even out.. and a toe will worked. I already have almost 4 inches of the center seam of the sole of foot (the edge with the BoR marker)and center seam of the back of leg-- so by the time I get to knitting the foot and the leg, there will be a nice bit of progress on each—but now? Every round (and I am still increasing every 3rd round!) 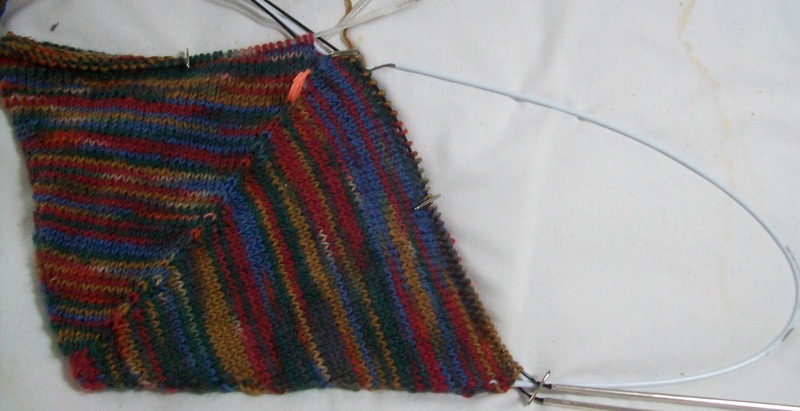 is twice the number of stitches found in a conventional sock—So progress is slow. 6 rounds since last photo? On a normal sock, the same number of stitches worked would be over an inch-- not a pittiful 3/8th of an inch! The other good news? I've dropped another pound. So progress is being made on that front, too. 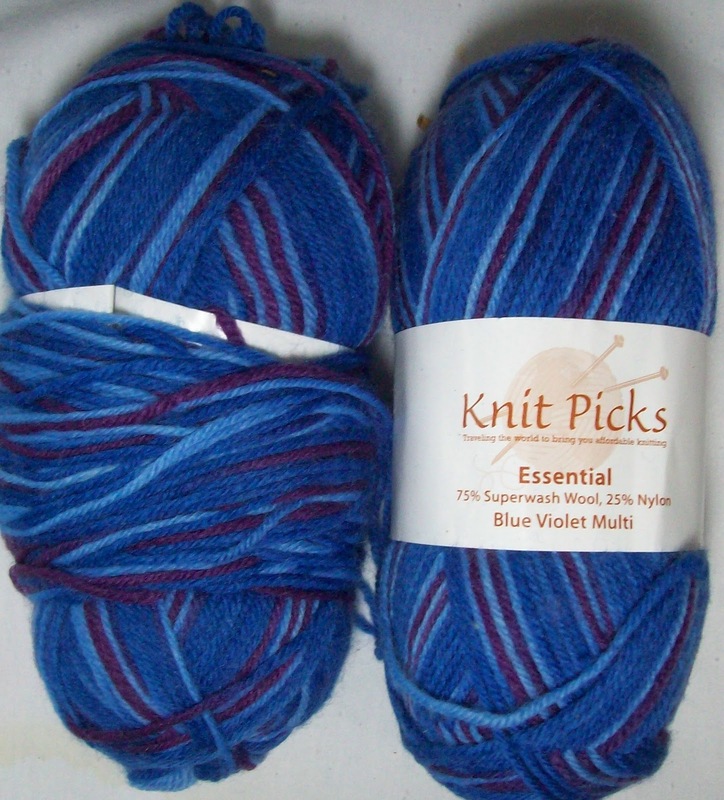 Where did this pair of Knit Pick sock yarn come from? --it lovely—but I have several other skeins in almost the same color. Why do I have so much PINK? Oh, look at this green—its hideous. What was I thinking buying it? And then there was the culling of photo—and organizing them. The theory being I shouldn't back up the blurred ones, or the dull ones. A thousand (well maybe just a hundred but it seemed like a thousand) folders are now condensed into monthly ones (some dating from 2009)—and 3 folders have been culled of unwanted images. Only 20 or so more to go. And that opens up another can of worms—Look at this yarn! (A skein of woodland rose (colorway) in a worsted weigh yarn.) I found this picture, and I remember buying it. But--Where did I stash it? It's so pretty—And what can I do with a single skein? Well a few more round have been added to sock—not so much as you'd really notice.. But the end is in sight for this first part! Soon (not soon enough, but soon!) I'll be ready to go to work on the foot--(and actually a good 3 inches—and by the time I finish, 4 inches of the sole will have been knit. Not so much of the instep.. but still all this knitting is doing something--its just taking a long time to look like a sock. A lot of work is getting done—in lots of different places.. Its just there is not much to show for it—anywhere! Next year, I am going to be neater and more organized. And while some progress is made, by the end of the year, it' s pretty clear, I am far from being neat and well organized! As the year comes to a close, I am once again cleaning up and sorting through piles of UFO's—and clutter. And once again, I am making an effort to make sense of my plans, my stash, my life. Yesterday morning— I spent a good hour untangling and winding up 6.5 oz of some lovely merino homespun—Next I will skein it up—and think about dying it--(What Color?!) And then what? A hat? A lacy scarf? Something else? It's not super wash, so some things are out of the running-no slippers or bed socks --they become by default slipper for a short while between getting up and getting showered-- and need to be washed way too often for hand washing. On the other hand, 6 oz of DK/light worsted weight yarn is a lot of yards—easily enough for a nice sized scarf or medium sized shawl. And its not the only yarn that been handled. A whole bunch of partial skeins have been neatened up and made into lovely little cakes on the ball winder. A bunch of jumbo (2.5 gallon) zip lock bags have been washed—and a dozen more purchased—I love storing fiber in these clear bags and finished stuff, too. I know that when yarn is in sight, it is half way to knitting it! The first few (5) sock kits have been put together—with yarn, and needles, and pattern—The yarn divided (when needed) into 2 cakes, and a index card with the general plan for the socks –or specific information (intended stitch pattern—and the book and page the stitch pattern can be found) added too. I've been making lists, too. Sweaters—and vests, and other things to knit, hats to knit, and patterns to write. I already have 3 scarf/shawl things on the list—Do I add another? And the list doesn't even have a full sized shawl on it—but my Daughter is getting married in October—perfect weather for wedding shawl—And maybe one for me, too? I have the yarn—Miles and miles of cob web weight merino--(I haven't balled that up yet!) --but I also have mile of silk merino, (lace but not cob web weight) and not too shabby a collection of silk, too. (a pastel color way, with a butter yellow predominating, or a huge skein of a dry crisp raw silk in shades of blue, and finally some dusty pink/mauve silk) There is also a beautiful blue angora/silk/merino blend (about 400 yards) or the dark teal blue Zepher--(silk/merino). For some one who swears every year I am never going to make another scarf/shawl—I have an awful lot of yarn for just that purpose! I even got a little knitting done. The secret socks have heels and an inch or so of leg—they will soon be complete. The public socks has had a measly 3 new rounds added by yesterday—but a few more rounds added last night. They look the same (just a little bigger) and this part of the sock isn't even half done.. so they won't look much different the next time they are seen! The Girl with Dragon Tattoo has been re-read, slowly and carefully, and now I am started on re-reading book 2 of the trilogy. There is a new calendar hanging on the wall next to my desk—and the console table in living room is just about cleared—this week end I will do the meager bit of decorating I do for the holiday. I have a lovely collection of glass tree's—all stylistically ever green--(some are even green glass) that I like to display—and I usually add a 6 foot tall conical tree of lights –on my terrace—but I don't hold out hopes that it will be open and ready for use before the new year –so there will be less than usually decorating. I am not a big fan of Christmas—and don't do much in the way to celebrate it. Much of the holiday is so commercial and meaningless, the religious part is almost lost. And I am not very religious—well not in an organized way. I have a strong spiritual life—but I don't go to church—and liturgically, (in the RC I was raised in) Christmas isn't really that big a holiday. It's become bigger as its become a more secular holiday—It can be fun for the children—but it can also be just about the gimmes, too. But maybe that is just my own negativity showing. And speaking of negativity—I am a bit annoyed that I haven't lost any weight in the past week! I feel like every meal is a big bowl of salad, and there have been no cookies, no snacks, no potato chip or ice cream (and no movement on the scale!) My leg is just about healed (the scab is gone—and there is tender pink skin in its place) and come the new year I will join the local pool and get involved in some water aerobic classes—I need not just to reduce calories—but to exercise more! Six little clear plastic purses (I wish I had a dozen!) have been cleaned out-the left over sock yarn stashed—the miscellaneous junk (pens, packs of tissues, business cards, etc) that crept into the bags, put away or discarded. Next, these bags will be packed up with new sock yarn—and pattern idea's—and in some cases, needles, (When I inherited stashes, I also inherited needles—I have LOTS of needles, and other knitting notions), a tape measure, a few stitch markers, and what ever else might be needed. What ever I don't have and will need, I add to the note with the pattern ideas. These sock kits will be my personal sock club—a handy way to plan my socks for the year. It very effective! I had misplaced my notebook with pattern ideas, and then retrieved it this weekend—I had 4 new ideas to add to sock list-- When I review it, I realized I had forgotten half the ideas I had written down just a few months ago! 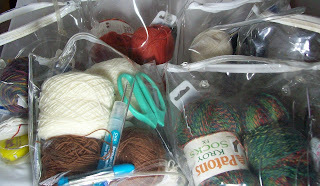 I know with out the list and the sock kit all packaged up, I would forget even more! The 4 new ideas brings my total list of ideas up to 16—Plus there is a list of another dozen ideas for my secret sock project. OK, some of them over lap, and some of the secret project socks are pretty generic--certainly the secret socks I am working on now are. The secret socks are about half done—With every step documented (and corrected!) and photographed along the way. Some (not a lot, but some) progress has also been made on December's socks—they still don't look much like socks—and with each round they will look less and less like any sort of sock you might know. But in the end, they will be just another pair of socks. One thing I love about Ravelry is how it reminds me what I have accomplished every year. This time of the year, I feel like I have knit nothing—Or, OK, a hat or two, or some sock socks, but nothing to speak of, nothing much. still, there they are, all those socks. And it's not just socks—there is a shrug, and 2 vests, a dozen hats, (6 summer lace hats, 5 warm wooly ones + a baby hat). There scarves and cowls, and simple squares,(for Robyn's art project), some fingerless gloves. Did I really knit all that in the past year? Maybe my knit list for the coming year isn't so ambitious after all! But nothing to show—It was all done on the pattern in progress. I am on a stretch of “work in established pattern” and want to get to the point of change—and take some photo's. I've been reading a lot, too. Which also cut into knitting time. Another thing is, I am on a medication that has very few side effects—and general mild ones, at that, but one side effect is I feel chilly—it doesn't last. Well maybe an hour or two—but for that hour or two I huddle under sweaters and comfors, and still, my hands and finger are uncomfortable cold. The chills pass as fast as they come on—but by then 2 hours of prime knitting time have passed! I spend the whole time thinking about the sweaters I could be knitting. The chills are so strange—I have always been the warm—or comfortable when everyone else is cold. I've worn short sleeved cotton t-shirts all winter long—not out, but indoors. And my apartment is usually like an oven—so for me to feel chilled—It's so out of place! Tomorrow, I am going to be joining others down at the Lion Brand Studio—They are having a Warm Up America Party—a bunch of us are going to be sewing together all the blocks that all of you (you know you are!) 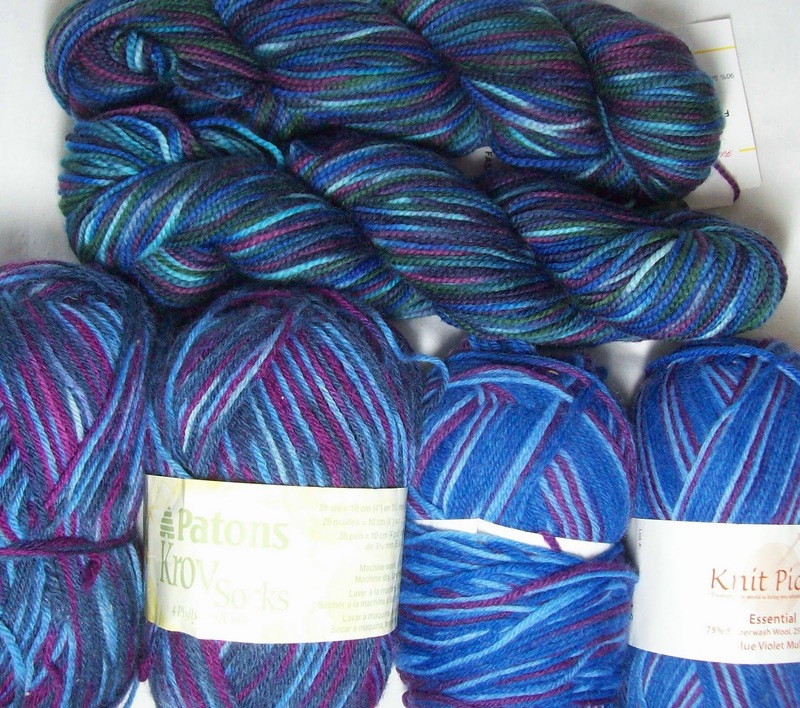 have knit and donated to the collection bins all over—Locally, Michaels has been one collection point—but there are other LYS that have participated as well. Joining blocks can be tedious—but done together—it will be fun. It will be so good to see a pile of squares turn into a finished blanket. Normally on Sunday, you'll find me a Panera's (my local Panera's in the new Rego Park Mall) but right now? The place is packed. It's too close and convenient to the stores! And, really even before the Christmas shopping season, it was a busy place and often hard to find a seat—Now it is impossible! My friend D will be joining me—so even the commute (the subway) will be a fun time. Plus—D is a new knitter (well just over a year of knitting now, and on her 2nd pair of socks) and hasn't ever been to the Lion Brand Studios—She's in for a real treat. A sock (what else is new?) --Not the toe, and clearly not the cuff, but the beginning of a sock none the less. 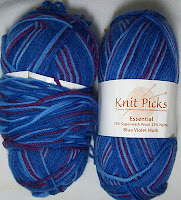 I had planned (at one point) to use this yarn for a pair of “Skew” socks—but I lost interest in that pattern. Now, I am doing a different pattern (sort of...I am making some adjustments to a pattern I say, and customizing it.) --it's a trendy thing. I've completed the first draft of one pattern—but I am still knitting the sample—I need to stop and take photographs of the progress and that's slowing me down. And there are 3 other patterns that are awaiting “tweaks” to make them perfect, some are hats, some are socks, some are others projects. There are over half a dozen patterns in the pipeline—Just waiting for me to finish them. I am moving in so many directions at once—Changing my eating habits, losing weight—(well not this week—the scale is being very unfriendly—I haven't gained back anything—but I am stuck for the moment), cleaning and re-organizing my living space, writing patterns and tutorials, reading... Knitting (actually pick up yarn and making stitches) has fallen to the wayside for the moment. It happens, but don't worry, the knitting content of this blog will resume! One delay was a mistake on my part (the required me dismantling everything all over again!) --It's what comes of buying parts (with almost no instructions) and missing a key piece of the work. And—in a bit of planned obsolescence, nothing could be salvaged from my old computer—New plugs, new sizes, new hardware—and the old is scrap. 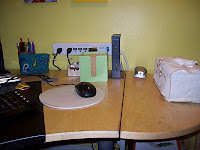 The second delay (well, it was my fault, too) came as I went to install the half round leaf extension of the desk. I spent an hour looking for a small piece of plastic (a spacer) and finally gave up. I figured I could improvise some sort of spacer. It was really annoying because I knew I had seen the space just a day or two ago, and could not think were I had put it as I was cleaning up-- and its been hanging around for almost 2 years waiting for me to put the leaf in place. The answer was—I screwed it into place—and as soon as I attempted to do the install (with the improvised spacer)—I found what I had just spent a long hour looking for! And—while I have got the video cam working (with out crashing the internet) I still can't get sound out of my speakers. When I check the sound icon on the task bar, it indicated things are working (previously it didn't which is what led me to replace the sound card (vs the speakers)) I think it might be time for new speakers as well. This project is endless! This new arrangement makes better use of the space. The BEST use of the space would involve turning the desk, and working facing the wall. But I've rejected that—I want to be able to just turn my head (and not my whole body) and be able to look out of the living room window—Yesterday was rainy and foggy, and there is nothing to see, but on clear days, like today, I have a wonderful view. It's going on two weeks now that I have been working on this project—and I would be so over it by now—except, it really looks good. I spend a lot of time at my computer desk—I like having it an inviting work space. During the breaks—I have been skeining up (and making up skeins) of yarn. Some 100gm balls of sock yarn got divided and balled up, and 1 ball of white became a skein—It will be hand painted--a Rudbeckia color way—deep yellow, crimson red and brown, one day soon. It will be divided, too, when it come time to make up balls. I think I will pair the hand painted yarn with a green and do star/flower like motifs in color work—It looks great in my mind eye—we'll see how it really works sometime next year! It's not knitting--but it is fiber related! What else? Tech writing. The little bit of knitting I am doing isn't ready for public consumption—it's a sample pattern that I am knitting, photographing, and documenting. It's the first of 12 patterns I hope to write in the next 6 months. So for now, I am doing as much writing (and re-writing) as I am knitting. Maybe even more writing than knitting if the truth be told. The pattern is being written to be needle neutral (or more accurately 3 times, once for DPN's, once for magic loop, and once for 2 at a time on 2 circ's. A good 90% of the time, it's cut and paste--but there are one or two places where there are differences. The 10% difference make up 90% of the work! My desk top is about 98% complete--(there are still papers to be shredded, and piles of new manuals and soft ware to be filed away)—but the end is in sight. 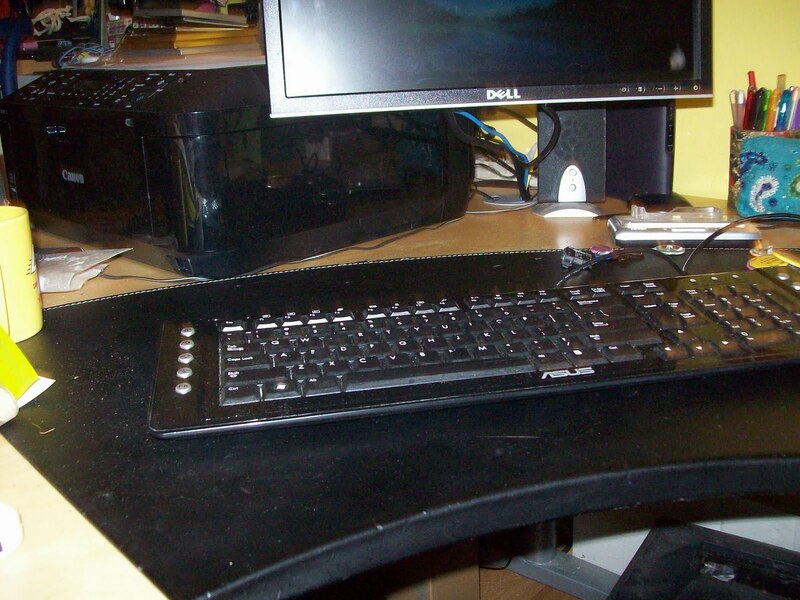 Even the keyboard got cleaned—all the dust (so much!) blown out with a can of air—and all the keys wiped clean with alcohol pads. Inch by inch things are getting done. Last night I picked up a new sound card—today I take apart all my neatly bundled wires (well just the tail end) and take my computer apart and restore sound. All should go well. But if you don't hear from me in a while, you'll know something went wrong! Well a few stitches(under 100). None of them photo worthy. Bits and pieces of other stuff done --Friday's clean laundry finally got put away Sunday AM. Mountains (well maybe not mountains, but a lot) of stuff that I had been saving “in case” got deemed worthless, and tossed. I confess to be border line hoarder—and I am always packing away stuff that might be useful someday—But every once in a while, I go on a cleaning binge and throw out mountains of stuff that I recognize is hopelessly out of date or just useless, or that just won't ever be fixed or made into something, or... And right now I am on a bit of a clean out and discarding binge. My next cleaning binge (I hope!) will involve clothing—Already a bunch of clothes are loose—and some are getting way to loose and just don't fit—In the most wonderful way. In the 8 weeks of recovery from my little bit of surgery, I have lost 15 pounds. I am not losing weight as fast—I knew I wouldn't be able to keep losing 2 pounds a week—but was a nice way to jump start weight loss. I had lost some weight last year (I dunno, maybe 10 pounds? Maybe more.) and some of my clothes were already a bit loose—I had to buy (well buy the makings of, and made) a few belts. Now those clothes are so loose that they slide off me (unbelted, a skirt with its waist band fastened falls easily over my hips) So I see the difference not just on the scale, but everywhere. Now I need to get out and exercise more—come the new year, I will make a point of getting to the pool and sign up for the water aerobic classes and go to them. I can't just yet—my wound is finally almost healed—the incision has moved from being a deep ugly crater, to now being a 99% scabbed (“granulated” in medial speak) little (well not that little but way smaller) injury. I don't want to be spending time in the pool to the whole thing is healed (and new pink skin (vs a scab) is all that is left. What I did most this week end is read—I can't say enough of how much I am enjoying the Stieg Larson's trilogy—I am racing through them—and then, once I know the story, I'll re read and savor all the details. Still to do? A second hole and chase for wires—It's a pain to drill in the compress strand board with Birch veneer desk top—The first one took 2 charges of the cordless drill—But I think its worth the effort. And a heavy duty velcro mount for the power strip is needed too. (My apartment is considered fireproof—the walls are plaster coated concrete. Great for safety but mounting most anything is a real PITA! You can't nail anything—you have to drill a hole (with a masonary bit) put in a plug and screw up everything. I am a big fan of 3M mounting strips for most of my art/wall decoration (the Command adhesive ones). But good as they are—even the big (which aren't very big) velcro strips won't hold up a power strip—Well-- they will if I never plug or unplug anything-but I unplug things (cel phone charger for one) all the time. Then sometime in the future—I'll pick up a new sound board—and take the CPU apart and replace it. 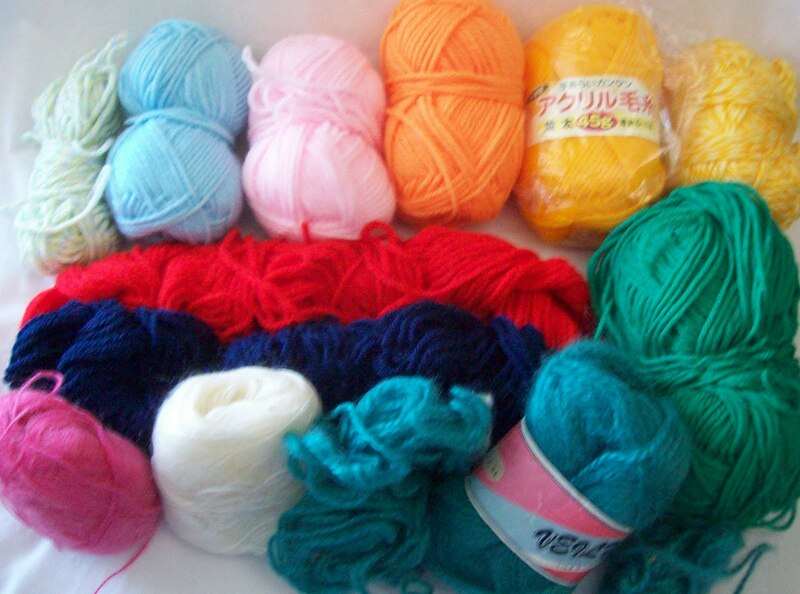 These yarns are bonuses from my sister—who haunts thrift shops (in Japan) and finds some wonderful stuff—Lovely wools, often, and some other interesting yarns. These aren't the best she's sent me.. but Oh, how wonderful to open the door to an unexpected package! The forstner bit eventually worked it way through the desk top- ONCE. I think its going to have to do it again before I am finished. The mouse and keyboard cable still snake across the top of the desk top, and some power cords are being pulled up at the wall side edge of the table –I think they would be neater routed through a chase. The kit (signum, from Ikea) came with the bit and 3 plastic liners and snap on covers—so drilling a second will time and effort –but I can do it. So far there are 2 power cords being pulled up to the front power strip --the CPU and the new monitor but before I am finished, the printer power cord will join. I have one of those energy saving power strips—with a Master/slave control. When the CPU goes to 'sleep' there are up to 4 outlets that are slaves. Power to these slaves get shut off—entirely. Power up the CPU, and power is automatically restored to the slaves. It's very convenient—you get to save power, with out having to turn everything off (and on) –again and again—and it does it for you if you forget! I am still not finished, but already, most of the mess of wire have been tamed –put into split tubes, labeled and routed under the desk (instead on top). I am going to wait till the last minute to tie wrap them to the table frame—In case some thing need to be re-routed-- but already it's so much neater! 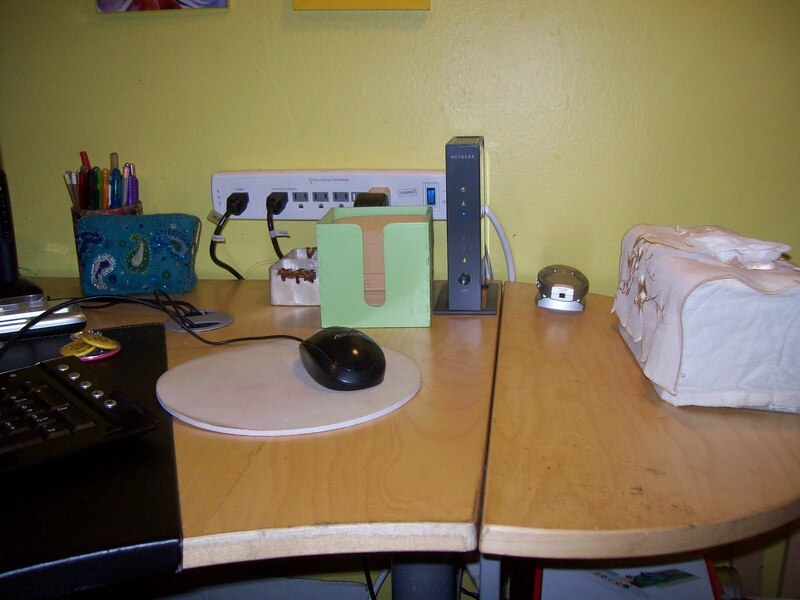 There more space, too without a rat's nest of wires snaking across the desk top. And it will be easier to keep clean. Still to come—hooking up the new monitor (which means moving the CPU)--but by the time I was finished drilling, and climbing under (and out from under the desk) a half dozen times—organizing the wires-- it was enough for the day. And I am likely going to have more work--my sound card conked out. Just as I am about to finish up the install of a nice big 19 inch monitor (and possible be able to watch a movie)-no sound! But Look--on a happier note! Socks—once again, in under the wire and finished in the same month they were started. I got some reading done, too. * But not the laundry—but it did get taken from the hamper, sorted, and made ready to go—the first thing I did this morning was to head down to the laundry room—only to find, it's closed (yet again!) for repairs—with no notice going up about it either! How annoying! *Lizbeth, (The Girl who Played with Fire)—she bought furniture for her new apartment—and bought the same desk (galant) that I have—I smiled at that!